Tuesday morning Carole and I met a friend for breakfast at a local joint, then the three of us set sail for Kenosha, Wisconsin. My friend Gary is moving away and wanted one last tango with us so he had a charter booked on Lake Michigan for some salmon fishing. What a riot. 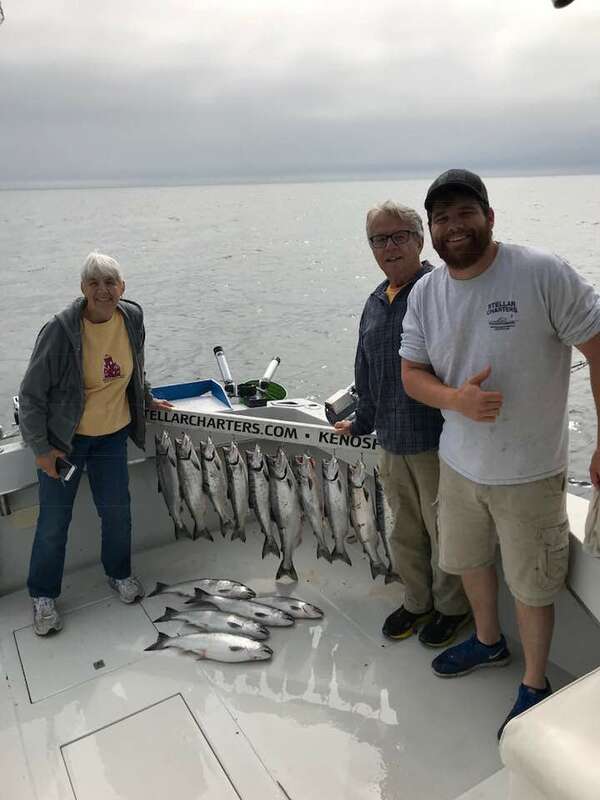 We had a six hour charter and had our three limits of coho and king salmon in about three hours. Nothing huge came to the net but 4 to 8 pound cohos and kings are darned fine eating so nobody bothered to complain. Our guide Shane, the big burly one in the picture is quite a guy: a decorated, two tour to Afghanistan Marine vet, a school teacher and tile layer as well as a seriously talented guide, he had us on fish constantly and kept us entertained with his great humor. This was a super trip even if it was a somewhat of a quickie.....basically over, sleep, fish, and then drive back....not quite 700 miles in two days. Every mile and every minute wonderful. This was a first for Carole, a chartered salmon trip, and the look on her face when those fish decided to take off was absolutely jaw cracking funny. Glade you had awesome action. Looks like you have some smoking in your future. Great trip! No one get sea sick? I took my two sons and two grandsons out a couple of times, but we had to give it up. One grandson always spent the entire trip seasick, but they were fun trips. Gary in the picture has a 17 foot boat that we have out-fitted with down riggers and fish Lake Superior with, often in waves up to six feet and we don't get sick. Carole doesn't get bothered by motion either. So no, nobody got sick. I know people who get seasick watching waves from shore. People who suffer from it sure miss out on a lot of fun.